Amy Ludwig VanDerwater is a writing teacher and children’s poet in Holland, NY. You can read her daily children’s poem and find writing ideas, book recommendations, and tips for students at her blog, The Poem Farm. Children’s poems such as these have embroidered my life with a layer of beauty and meaning. They have also taught me how to say more with less, how to wait for one word, and how to recognize and experiment with different writing structures. Poems, denser and more immediate than novels, can feed our student readers in many ways. We may quickly laugh together, instantly connect with a sad moment, learn something new, or be reminded of a friend in a mere few lines. We can develop tastes and favorites in poets, and we can memorize lines to keep forever inside of us. Poetry is the great teacher of many lessons, lessons about life and language too. One family of lessons that poetry can teach us is a course in structure, the many ways we can organize our ideas. Structure describes the bones of a piece. Is it a list? Does the piece of writing have two parts? Is it a series of questions and answers? Is it about one discreet blip in time? Out here in the country, when our children find an animal skeleton, my husband can tell us if it is a raccoon or a groundhog. He knows the shape of things in nature, and with poems we can easily see the shape of ideas made out of words. When we identify and understand the ways that other writers organize their ideas, we will naturally borrow and try these “dress up structures” out for ourselves. At times, poetry gets pushed aside and pushed away from read aloud time. Seeing the potential for structure-lessons in poetry is one possible way to encourage poetry-reluctant teachers to celebrate poems. How Might We Explore Structure and Organization Through Poetry? Structure-of-the-Month – We might set up a constant bulletin board highlighting one structure for each month. If the structure for October is a list structure, the board will include an explanation of this structure, a poem such as Charles Ghinga’s “Life is a Snowflake,” read aloud books on the chalk-rail written in this structure, and student pieces which reflect this way to organize writing. If we’re lucky, we’ll find a quote about organizing writing like this, and if we’re smart, we’ll include a diagram of how the structure works. Students can decide and draw how to represent various structures visually. Revision Unit with a Structure Focus – Later in the year, we can teach a revision unit spotlighting structure. 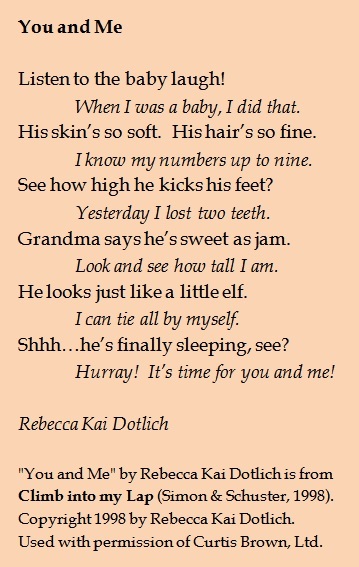 We can look at Rebecca’s “You and Me” and write our own poems that go back and forth between two voices. Using poems as texts to study, students can learn to fashion old material in new ways, ending up with pieces in many structures. Poetry Anthology Highlighting Structure – Students who love writing about the same topic over and over again might learn different structures of poems and write about one topic in many different ways. Similarly, at the end of a content area unit, students might publish a poetry anthology showcasing what they have learned in different poetic structures. Lisa Westberg Peters’ book Earthshake, is an example of a poetry book which approaches a scientific topic from many organizational standpoints including recipe, instructions, and even obituary! With any of these ideas, I would be sure to give copies of poems to students, highlighting each structure. Such small texts may be glued into notebooks in a structure section, a poetry section, or just scattered throughout to use as reference. As writers, we all deserve to be well-fed. Structure-study through poetry is one way to invite children – and ourselves – to the overflowing table of possibility in writing. I am very thankful to my generous teachers-from-afar, Lee Bennett Hopkins, Rebecca Dotlich, and Charles Ghigna for their generosity in allowing me to share their poems at the beginning of this post. You chose some great examples.I’ve enjoyed keeping up with your own poems and put your blog on my home page so I can enjoy your daily post. You took on a major challenge and you’ve been so dedicated to fulfilling that. I love to share poetry ideas with the students in my school and you’ve passed along some ideas I’ll tuck away for next year. Thanks! Happy versing! Thank you for sharing your thoughts. 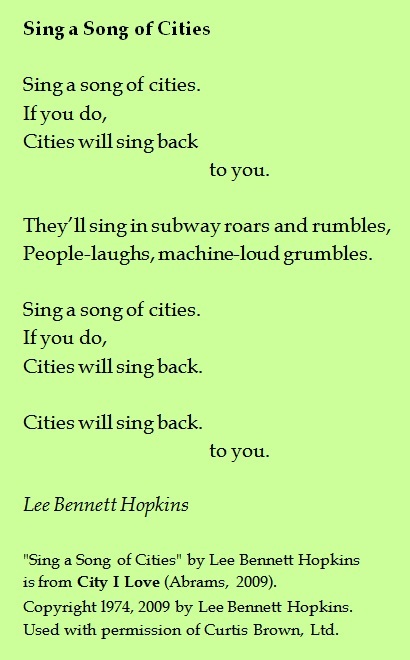 I want to include more poetry next year as read alouds. This year I wanted to have Poetry Friday each week, but as you mentioned poetry ended up getting pushed to the side as I realized that I constantly had more than I should have going on. I have been thinking of expanding the type of texts I read aloud from for next year, instead of it always being a novel. As I continue to work toward integrating more poetry, I will have to revisit this post for the great ideas!